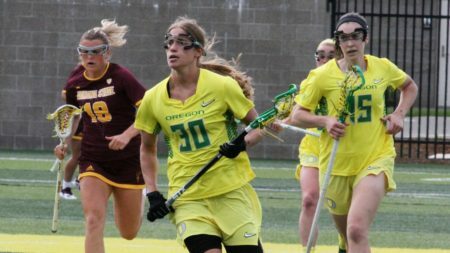 The Oregon Ducks closed out their 2018 home schedule in impressive fashion, blasting Arizona State 21-8 on Friday afternoon then upsetting 16th-ranked USC 18-11 in Sunday’s finale at Pape` Field. Sunday’s victory was first for the Ducks over a ranked opponent in ten years but it was Friday’s victory over the Sun Devils that featured the most fireworks. ASU opened the scoring 2:24 seconds into the match then was left in a smoldering ruins as the Ducks scored 14 straight goals in just over 12 minutes of clock time on their way to the 21-8 romp. Jill Zubillaga led the way with six goals. Oregon scored their 21 goals with just 33 shots while the defense limited the Sun Devils to only 22 shots. The offensive momentum carried over to Sunday’s senior day sendoff against USC. Again after yielding an opening goal, the Oregon offense exploded with a string of goals – ten this time in just over 15 minutes of play. Each team put together a flurry of goals in the second period but the Ducks’ early margin was never seriously threatened. Jojo Hesketh paced the Ducks with five goals and Mariah Gatti added four to help the cause. With the sweep Oregon’s record improves to 8-5 overall and 4-3 in Pac-12 play. The Ducks will conclude the season with a pair of games in the Bay Area this weekend with the finale set for Boulder on Friday, April 20th. The Pac-12 tournament will be hosted by the Buffaloes beginning April 26th. The post Ducks’ Offense Comes Alive For Senior Weekend Sweep appeared first on DuckNews.com.